You've been to many different doctors, and you're still having problems. In fact, you seem to be getting worse, not better. Unfortunately, medical health is not an exact science, and your doctor may have to try a few different methods before finding what works for you. However, if you're frustrated with the care that you've been receiving, it's also possible that medical malpractice is a cause. Other healthcare providers may confirm these suspicions. A doctor may not come right out and tell you that they suspect a colleague of medical malpractice. Instead, they may subtly hint at their suspicions, whether knowingly or not. Keep in mind that a doctor's use of these phrases doesn't necessarily mean that your initial healthcare provider did something wrong. However, it might be a clue that something is not quite right, especially if you already suspect medical malpractice in St. Louis. You may want to ask other healthcare professionals what they know about the doctor, team, or hospital that was involved in your initial care. Certain doctors and hospitals may have a reputation among their colleagues. It may also be to your benefit to talk to an experienced St. Louis malpractice attorney. Often, lawyers know a bit about doctors' reputations as well, and they can certainly recognize the signs of malpractice. 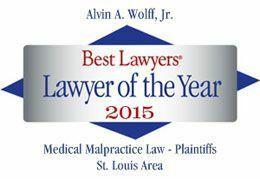 To request a free consultation or to order The Guide on How to Pick a Lawyer, call Alvin Wolff at 314-241-2500 today.